If you’re ready to make the step up to a high-performance blender, the Vitamix 5200 is a great place to start. The powerful motor and durable construction make this classic blender one of the best heavy duty blenders on the market. It is a commercial-grade blender in a household package. It’s a member of the C-Series (Classic) family and is the most popular blender in that line. 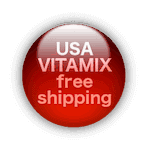 You can get free shipping on your new Vitamix 5200 order when you purchase direct from Vitamix using this link. 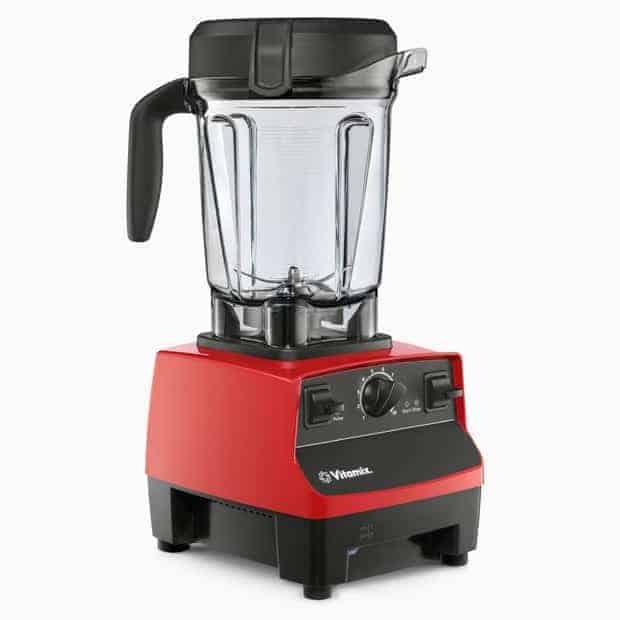 The Vitamix 5200 stands 20.5” tall when the 64 oz container is sitting atop the motor base. The base itself measures 7.25″ wide, 8.75″ deep and weighs in at 10.5625 lbs. This unit has a 3-pronged power cord that measures a lengthy 6 feet, but can be wound up and stored beneath the motor base allowing you to leave out only as much as you need. The Vitamix 5200 is available in one of five colors (red, black, white, platinum, or brushed stainless). The Vitamix 5200 model is available as part of several different configurations: standard, super, deluxe, or compact container packages. Each is slightly different, but every one comes with a Whole Food Recipes cookbook, a Getting Started guide, a Let’s Get Started DVD, and a tamper. Every Vitamix 5200 comes with a BPA-free Eastman Tritan™ copolyester container. The container includes improved sound damping features and sits a square rubber pad which helps cushion the container and dampen any vibration caused during operation. It is fitted with an ergonomic soft grip handle that makes pouring very easy. 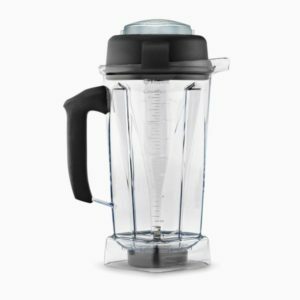 The lid for the Eastman Tritan jars is Vitamix’s patented easy-off 2-part vented lid and features a removable twist-off lid plug to prevent any spillage when adding ingredients during blending. The motor is a 2-peak horsepower, Swedish built motor specifically designed and developed for use in the Vitamix 5200 and is capable of spinning the blades up to 37,000 revolutions per minute. Though the motor is designed and manufactured in Sweden, the rest of the product is manufactured and assembled in the United States, in Cleveland, Ohio. The 5200 is fitted with a radial cooling fan for efficient cooling even at high speeds and this is complemented by Vitamix’s thermal protection system in order to prevent the motor overloading or burning out. This video shows the amazing power of this motor when paired with the advanced design of the container and blades. Anything you put inside is sucked down and into the blades almost immediately. The Vitamix 5200 is controlled by manual switches and a speed dial. It does not have a touchpad or preprogrammed settings like some of the other high-performance blenders. The switches are made from ‘soft-touch’ rubber, which is an improvement since the earlier 5000 model, and the material is durable and easy to work with. You are able to control the speed with one switch and turn the machine on and off with the other. The center dial, also made from ‘soft-touch’ rubber controls the variable speed of the machine. Whether you’re making whole juices or smoothies, soups or syrups, even ice-cream, it is best to start the blender on low and move up to higher speeds as it is running. It will be necessary to watch the blender until you have the consistency you are aiming for since this machine will not shut itself off automatically. 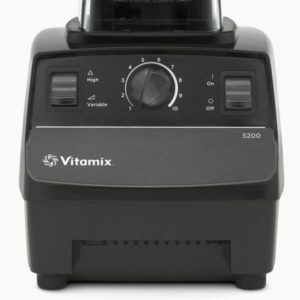 The Vitamix 5200 is available in the Certified Reconditioned Standard package which will save you $120 over the cost of purchasing a brand new 5200. The engineering and remarkable power allow you to get the most from almost any produce. You are able to create genuine whole juice from raw fruit and vegetables and release all of the nutrients from the pulp, fiber, skins, and cores. The variable speed setting means that not only can you make juices and smoothies you can mix ice-cream and chop salsas on the low settings and heated soups and fondues on full power. The Vitamix 5200‘s power, durability and 7-year warranty makes it an excellent choice for anyone looking to get started with their first high-performance blender. Hi there , I just purchased my Vitamix in Mexico , Aguascalientes ,via Costco, my friend had one for a while and I saw how great it is , so I replace my Nutribullet for Vitamax , so I can make more juices at once , and be able to regulate the speeds ,espero mucha gente adquiera esta herramienta para hacer su cocina mas eficiente , gracias ! Our family of three with a little one being 9 months now have turned vegan and moving towards raw food ,and I feel inspired to buy vitamix after reading so many positive reviews . One issue is I am working in Muscat , in Oman can I get it delivered here with additional charges . Great to hear that you’ve recently gone the vegan route! Vitamix doesn’t directly distribute US models outside of the US, but they do have a distributor based in Oman. Here’s a link to their information – https://www.vitamix.com/international/countryDetails.jsp?id=OM. Hope that helps! The 5200 has served me well for the past 10 years, but now I’m ready to upgrade and buy a Vitamix 7500. These blenders are great and I’m looking forward to many more years of blending things with my new one!